What you need to know about finding Cocaine Drug Rehab. Step one is to find out what adverse effects the person is presenting and establish that this is the drug of choice? Many use this drug in conjunction with alcohol and it is important to know if the persons is going to need medical detox, which could be the case with strong alcohol involvement. Addiction to this drug doesn’t require specific detox or withdrawal procedure since cocaine is not physically addicting, but a person that has been using cocaine daily and with high frequency, the person will be physically and emotionally exhausted and it make take up to a week’s rest to have the stamina to do well with the rigors of treatment. After these facts have been established, call our licensed counselor to determine what modality of drug addiction treatment is best for you or the loved one your attempting to help. Crack and Cocaine– These drugs are powerfully addictive drugs of abuse. Once having tried crack form, an individual cannot predict or control the extent to which he or she will continue to use the drug. The facts about cocaine are comprehensively covered in an article by “Random Facts”, which lists 41 interesting cocaine facts. The article is worth reading and then you can come back to this page to continue learning about cocaine and have the benefit of calling about your specific problem at 888-781-7060 or sending in your question via our submission form located on the Contact Us page. The major routes of administration of this drug are sniffing or snorting, injecting, and smoking (including free-base and crack cocaine). Snorting is the process of inhaling cocaine powder through the nose where it is absorbed into the bloodstream through the nasal tissues. Injecting is the act of using a needle to release the drug directly into the bloodstream. Smoking involves inhaling cocaine vapor or smoke into the lungs where absorption into the bloodstream is as rapid as by injection. “Crack” is the street name given to cocaine that has been processed from cocaine hydrochloride to a free base for smoking. Rather than requiring the more volatile method of processing cocaine using ether, crack cocaine is processed with ammonia or sodium bicarbonate (baking soda) and water and heated to remove the hydrochloride, thus producing a form of the drug that can be smoked. The term “crack” refers to the crackling sound heard when the mixture is smoked (heated), presumably from the sodium bicarbonate. 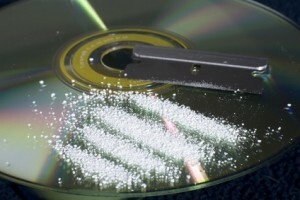 There is great risk whether cocaine is ingested by inhalation (snorting), injection, or smoking. It appears that compulsive use may develop even more rapidly if the substance is smoked rather than snorted. Smoking allows extremely high doses of cocaine to reach the brain very quickly and brings an intense and immediate high. The injecting drug user is at risk for transmitting or acquiring HIV infection/AIDS if needles or other injection equipment are shared. Cocaine is a strong central nervous system stimulant that interferes with the reabsorption process of dopamine, a chemical messenger associated with pleasure and movement. Dopamine is released as part of the brain’s reward system and is involved in the high that characterizes consumption of this drug. Physical effects of this drug use include constricted peripheral blood vessels, dilated pupils, and increased temperature, heart rate, and blood pressure. The duration of cocaine’s immediate euphoric effects, which include hyper-stimulation, reduced fatigue, and mental clarity, depends on the route of administration. The faster the absorption, the more intense the high. On the other hand, the faster the absorption, the shorter the duration of action. The high from snorting may last 15 to 30 minutes, while that from smoking may last 5 to 10 minutes. Increased use can reduce the period of stimulation. Users of cocaine report feelings of restlessness, irritability, and anxiety. An appreciable tolerance to the high may be developed, and many addicts report that they seek but fail to achieve as much pleasure as they did from their first exposure. Scientific evidence suggests that the powerful neuropsychologic reinforcing property of this drug is responsible for an individual’s continued use, despite harmful physical and social consequences. In rare instances, sudden death can occur on the first use of cocaine or unexpectedly thereafter. However, there is no way to determine who is prone to sudden death. High doses of cocaine and/or prolonged use can trigger paranoia. Smoking crack can produce a particularly aggressive paranoid behavior in users. When addicted individuals stop using cocaine, they often become depressed. This also may lead to further use to alleviate depression. Prolonged snorting can result in ulceration of the mucous membrane of the nose and can damage the nasal septum enough to cause it to collapse. Drug-related deaths from this drug are often a result of cardiac arrest or seizures followed by respiratory arrest. When people mix cocaine and alcohol consumption, they are compounding the danger each drug poses and unknowingly forming a complex chemical experiment within their bodies. NIDA-funded researchers have found that the human liver combines cocaine and alcohol and manufactures a third substance, cocaethylene, that intensifies cocaine’s euphoric effects, while possibly increasing the risk of sudden death. The MTF assesses the extent of drug use among adolescents and young adults across the country. The proportion of high school seniors who have used cocaine at least once in their lifetimes has increased from a low of 5.9 percent in 1994 to 9.8 percent in 1999. However, this is lower than its peak of 17.3 percent in 1985. Current (past month) use of this drug by seniors decreased from a high of 6.7 percent in 1985 to 2.6 percent in 1999. Also in 1999, 7.7 percent of 10th-graders had tried cocaine at least once, up from a low of 3.3 percent in 1992. The percentage of 8th-graders who had ever tried cocaine has increased from a low of 2.3 percent in 1991 to 4.7 percent in 1999. Of college students 1 to 4 years beyond high school, in 1995, 3.6 percent had used cocaine within the past year, and 0.7 percent had used cocaine in the past month.